Benzodiazepine dependence is when one has developed one or more of either tolerance, withdrawal symptoms, drug seeking behaviors, such as continued use despite harmful effects, and maladaptive pattern of substance use, according to the DSM-IV. In the case of benzodiazepine dependence, however, the continued use seems to be associated with the avoidance of unpleasant withdrawal reaction rather than from the pleasurable effects of the drug. Benzodiazepine dependence develops with long-term use, even at low therapeutic doses, without the described dependence behavior. Addiction, or what is sometimes referred to as psychological dependence, includes people misusing or craving the drug not to relieve withdrawal symptoms, but to experience its euphoric or intoxicating effects. It is necessary to distinguish between addiction and drug abuse of benzodiazepines and normal physical dependence on benzodiazepines. The increased GABAA inhibition caused by benzodiazepines is counteracted by the body’s development of tolerance to the drug’s effects; the development of tolerance occurs as a result of neuroadaptations, which result in decreased GABA inhibition and increased excitability of the glutamate system; these adaptations occur as a result of the body trying to overcome the central nervous system depressant effects of the drug to restore homeostasis. When benzodiazepines are stopped, these neuroadaptations are “unmasked” leading to hyper-excitability of the nervous system and the appearance of withdrawal symptoms. Therapeutic dose dependence is the largest category of people dependent on benzodiazepines. These individuals typically do not escalate their doses to high levels or abuse their medication. Smaller groups include patients escalating their dosage to higher levels and drug misusers as well. It is unclear exactly how many people illicitly abuse benzodiazepines. Tolerance develops within days or weeks to the anticonvulsant, hypnotic muscle relaxant and after 4 months there is little evidence that benzodiazepines retain their anxiolytic properties. Some authors, however, disagree and feel that benzodiazepines retain their anxiolytic properties. Long-term benzodiazepine treatment may remain necessary in certain clinical conditions. Numbers of benzodiazepine prescriptions have been declining, due primarily to concerns of dependence. In the short term, benzodiazepines can be effective drugs for acute anxiety or insomnia. With longer-term use, other therapies, both pharmacological and psychotherapeutic, become more effective. This is in part due to the greater effectiveness over time of other forms of therapy, and also due to the eventual development of pharmacological benzodiazepine tolerance. The core structure of benzodiazepines. “R” labels denote common locations of side chains, which give different benzodiazepines their unique properties. attempts to cut down or stop benzodiazepine use, tolerance to the effects of benzodiazepines, and withdrawal symptoms when not taking the drug. Some withdrawal symptoms that may appear include anxiety, depressed mood, depersonalisation, derealisation, sleep disturbance, hypersensitivity to touch and pain, tremor, shakiness, muscular aches, pains, twitches, and headache. Benzodiazepine dependence and withdrawal have been associated with suicide and self-harming behaviors, especially in young people. The Department of Health substance misuse guidelines recommend monitoring for mood disorder in those dependent on or withdrawing from benzodiazepines. Benzodiazepine dependence is a frequent complication for those prescribed for or using for longer than four weeks, with physical dependence and withdrawal symptoms being the most common problem, but also occasionally drug-seeking behavior. Withdrawal symptoms include anxiety, perceptual disturbances, distortion of all the senses, dysphoria, and, in rare cases, psychosis and epileptic seizures. Long-term use and benzodiazepine dependence is a serious problem in the elderly. Failure to treat benzodiazepine dependence in the elderly can cause serious medical complications. The elderly have less cognitive reserve and are more sensitive to the short (e.g., in between dose withdrawal) and protracted withdrawal effects of benzodiazepines, as well as the side-effects both from short-term and long-term use. This can lead to excessive contact with their doctor. Research has found that withdrawing elderly people from benzodiazepines leads to a significant reduction in doctor visits per year, it is presumed, due to an elimination of drug side-effects and withdrawal effects. Tobacco and alcohol are the most common substances that elderly people get a dependence on or misuse. The next-most-common substance that elderly people develop a drug dependence to or misuse is benzodiazepines. Drug-induced cognitive problems can have serious consequences for elderly people and can lead to confusional states and “pseudo-dementia”. About 10% of elderly patients referred to memory clinics actually have a drug-induced cause that most often is benzodiazepines. Benzodiazepines have also been linked to an increased risk of road traffic accidents and falls in the elderly. The long-term effects of benzodiazepines are still not fully understood in the elderly or any age group. Long-term benzodiazepine use is associated with attentional and visuospatial functional impairments. Withdrawal from benzodiazepines can lead to improved alertness and decreased forgetfulness in the elderly. Withdrawal led to statistical significant improvements in memory function and performance related skills in those having withdrawn successfully from benzodiazepines, whereas those having remained on benzodiazepines experienced worsening symptoms. People having withdrawn from benzodiazepines also felt their sleep was more refreshing, making statements such as “I feel sharper when I wake up” or “I feel better, more awake“, or “It used to take me an hour to fully wake up.” This suggests that benzodiazepines may actually make insomnia worse in the elderly. Tolerance occurs to the muscle-relaxant, anticonvulsant, and sleep-inducing effects of benzodiazepines, and upon cessation a benzodiazepine withdrawal syndrome occurs. This can lead to benzodiazepines being taken for longer than originally intended, as people continue to take the drugs over a long period of time to suppress withdrawal symptoms. Some people abuse benzodiazepines at very high doses and devote a lot of time to doing so, satisfying the diagnostic criteria in DSM IV for substance abuse and dependence. Another group of people include those on low to moderate therapeutic doses of benzodiazepines who do not abuse their benzodiazepines but develop a tolerance and benzodiazepine dependence. A considerable number of individuals using benzodiazepines for insomnia escalate their dosage, sometimes above therapeutically-prescribed dose levels. Tolerance to the anxiolytic effect of benzodiazepines has been clearly demonstrated in rats. In humans, there is little evidence that benzodiazepines retain their anti-anxiety effects beyond four months of continuous treatment; there is evidence that suggests that long-term use of benzodiazepines may actually worsen anxiety, which in turn may lead to dosage escalation, with one study finding 25% of patients escalated their dosage. Some authors, however, consider benzodiazepines to be effective long-term; however, it is more likely that the drugs are acting to prevent rebound anxiety withdrawal effects. Tolerance to the anticonvulsant and muscle-relaxing effects of benzodiazepines occurs within a few weeks in most patients. The risk factors for benzodiazepine dependence are long-term use beyond four weeks, use of high doses, use of potent short-acting benzodiazepines, dependent personalities, and proclivity for drug abuse. Use of short-acting benzodiazepines leads to repeated withdrawal effects that are alleviated by the next dose, which reinforce in the individual the dependence. A physical dependence develops more quickly with higher potency benzodiazepines such as alprazolam (Xanax) than with lower potency benzodiazepines such as chlordiazepoxide (Librium). Symptom severity is worse with the use of high doses, or with benzodiazepines of high potency or short half-life. Other cross-tolerant sedative hypnotics, such as barbiturates or alcohol, increase the risk of benzodiazepine dependence. Similar to opioids’ use for pain, therapeutic use of benzodiazepines rarely leads to substance abuse. Tolerance develops rapidly to the sleep-inducing effects of benzodiazepines. The anticonvulsant and muscle-relaxant effects last for a few weeks before tolerance develops in most individuals. Tolerance results in a desensitization of GABA receptors and an increased sensitization of the excitatory neurotransmitter system, such as NMDA glutamate receptors. These changes occur as a result of the body trying to overcome the drug’s effects. Other changes that occur are the reduction of the number of GABA receptors (downregulation) as well as possibly long-term changes in gene transcription coding of brain cells. The differing speed at which tolerance occurs to the therapeutic effects of benzodiazepines can be explained by the speed of changes in the range of neurotransmitter systems and subsystems that are altered by chronic benzodiazepine use. The various neurotransmitter systems and subsystems may reverse tolerance at different speeds, thus explaining the prolonged nature of some withdrawal symptoms. As a result of a physical dependence that develops due to tolerance, a characteristic benzodiazepine withdrawal syndrome often occurs after removal of the drug or a reduction in dosage. Changes in the expression of neuropeptides such as corticotropin-releasing hormone and neuropeptide Y may play a role in benzodiazepine dependence. Individuals taking daily benzodiazepine drugs have a reduced sensitivity to further additional doses of benzodiazepines. Tolerance to benzodiazepines can be demonstrated by injecting diazepam into long-term users. In normal subjects, increases in growth hormone occurs, whereas, in benzodiazepine-tolerant individuals, this effect is blunted. Animal studies have shown that repeated withdrawal from benzodiazepines leads to increasingly severe withdrawal symptoms, including an increased risk of seizures; this phenomenon is known as kindling. Kindling phenomena are well established for repeated ethanol (alcohol) withdrawal; alcohol has a very similar mechanism of tolerance and withdrawal to benzodiazepines, involving the GABAa, NMDA, and AMPA receptors. The shift of benzodiazepine receptors to an inverse agonist state after chronic treatment leads the brain to be more sensitive to excitatory drugs or stimuli. Excessive glutamate activity can result in excitotoxicity, which may result in neurodegeneration. The glutamate receptor subtype NMDA is well known for its role in causing excito-neurotoxicity. The glutamate receptor subtype AMPA is believed to play an important role in neuronal kindling as well as excitotoxicity during withdrawal from alcohol as well as benzodiazepines. It is highly possible that NMDA receptors are involved in the tolerance to some effects of benzodiazepines. Animal studies have found that glutamergic changes as a result of benzodiazepine use are responsible for a delayed withdrawal syndrome, which in mice peaks 3 days after cessation of benzodiazepines. This was demonstrated by the ability to avoid the withdrawal syndrome by the administration of AMPA antagonists. It is believed that different glutamate subreceptors, e.g., NMDA and AMPA, are responsible for different stages/time points of the withdrawal syndrome. NMDA receptors are upregulated in the brain as a result of benzodiazepine tolerance. AMPA receptors are also involved in benzodiazepine tolerance and withdrawal. A decrease in benzodiazepine binding sites in the brain may also occur as part of benzodiazepine tolerance. Benzodiazepines share a similar mechanism of action with various sedative compounds that act by enhancing the GABAA receptor. Cross tolerance means that one drug will alleviate the withdrawal effects of another. It also means that tolerance of one drug will result in tolerance of another similarly-acting drug. Benzodiazepines are often used for this reason to detoxify alcohol-dependent patients and can have life-saving properties in preventing or treating severe life-threatening withdrawal syndromes from alcohol, such as delirium tremens. However, although benzodiazepines can be very useful in the acute detoxification of alcoholics, benzodiazepines in themselves act as positive reinforcers in alcoholics, by increasing the desire for alcohol. Low doses of benzodiazepines were found to significantly increase the level of alcohol consumed in alcoholics. Alcoholics dependent on benzodiazepines should not be abruptly withdrawn but be very slowly withdrawn from benzodiazepines, as over-rapid withdrawal is likely to produce severe anxiety or panic, which is well known for being a relapse risk factor in recovering alcoholics. There is cross tolerance between alcohol, the benzodiazepines, the barbiturates, the nonbenzodiazepine drugs, and corticosteroids, which all act by enhancing the GABAA receptor’s function via modulating the chloride ion channel function of the GABAA receptor. Withdrawal symptoms are a normal response in individuals having chronically used benzodiazepines, and an adverse effect and result of drug tolerance. Symptoms typically emerge when dosage of the drug is reduced. GABA is the second-most-common neurotransmitter in the central nervous system (the most common being glutamate) and by far the most abundant inhibitory neurotransmitter; roughly one-quarter to one-third of synapses use GABA. The use of benzodiazepines has a profound effect on almost every aspect of brain and body function, either directly or indirectly. 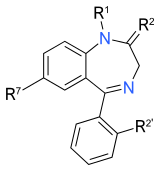 Benzodiazepines cause a decrease in norepinephrine (noradrenaline), serotonin, acetylcholine, and dopamine. These neurotransmitters are needed for normal memory, mood, muscle tone and coordination, emotional responses, endocrine gland secretions, heart rate, and blood pressure control. With chronic benzodiazepine use, tolerance develops rapidly to most of its effects, so that, when benzodiazepines are withdrawn, various neurotransmitter systems go into overdrive due to the lack of inhibitory GABA-ergic activity. Withdrawal symptoms then emerge as a result, and persist until the nervous system physically reverses the adaptions (physical dependence) that have occurred in the CNS. Withdrawal symptoms typically consist of a mirror image of the drug’s effects: Sedative effects and suppression of REM and SWS stages of sleep can be replaced by insomnia, nightmares, and hypnogogic hallucinations; its antianxiety effects are replaced with anxiety and panic; muscle-relaxant effects are replaced with muscular spasms or cramps; and anticonvulsant effects are replaced with seizures, especially in cold turkey or overly-rapid withdrawal. Benzodiazepine withdrawal represents in part excitotoxicity to brain neurons. Rebound activity of the hypothalamic-pituitary-adrenocortical axis also plays an important role in the severity of benzodiazepine withdrawal. Tolerance and the resultant withdrawal syndrome may be due to alterations in gene expression, which results in long-term changes in the function of the GABAergic neuronal system. During withdrawal from full or partial agonists, changes occur in benzodiazepine receptor with upregulation of some receptor subtypes and downregulation of other receptor subtypes. Long-term use of benzodiazepines leads to increasing physical and mental health problems, and as a result, discontinuation is recommended for many long-term users. The withdrawal syndrome from benzodiazepines can range from a mild and short-lasting syndrome to a prolonged and severe syndrome. Withdrawal symptoms can lead to continued use of benzodiazepines for many years, long after the original reason for taking benzodiazepines has passed. Many patients know that the benzodiazepines no longer work for them but are unable to discontinue benzodiazepines because of withdrawal symptoms. Withdrawal symptoms can emerge despite slow reduction but can be reduced by a slower rate of withdrawal. As a result, withdrawal rates have been recommended to be customized to each individual patient. The time needed to withdrawal can vary from a couple of months to a year or more and often depends on length of use, dosage taken, lifestyle, health, and social and environmental stress factors. Diazepam is often recommended due to its long elimination half-life and also because of its availability in low potency doses. The non-benzodiazepine Z drugs such as zolpidem, zaleplon, and zopiclone should not be used as a replacement for benzodiazepines, as they have a similar mechanism of action and can induce a similar dependence. The pharmacological mechanism of benzodiazepine tolerance and dependence is the internalization (removal) of receptor site in the brain and changes in gene transcription codes in the brain. With long-term use and during withdrawal of benzodiazepines, treatment-emergent depression and emotional blunting may emerge and sometimes also suicidal ideation. There is evidence that the higher the dose used the more likely it is benzodiazepine use will induce these feelings. Reducing the dose or discontinuing benzodiazepines may be indicated in such cases. Withdrawal symptoms can persist for quite some time after discontinuing benzodiazepines. Some common protracted withdrawal symptoms include anxiety, depression, insomnia, and physical symptoms such as gastrointestinal, neurologic, and musculoskeletal effects. The protracted withdrawal state may still occur despite slow titration of dosage. It is believed that the protracted withdrawal effects are due to persisting neuroadaptations. For a diagnosis of benzodiazepine dependence to be made, the ICD-10 requires that at least 3 of the below criteria are met and that they have been present for at least a month, or, if less than a month, that they appeared repeatedly during a 12-month period. Behavioral, cognitive, and physiological phenomena that are associated with the repeated use and that typically include a strong desire to take the drug. Increased tolerance to effects of the drug and sometimes a physical withdrawal state. Benzodiazepine dependence should be suspected also in individuals having substance use disorders including alcohol, and should be suspected in individuals obtaining their own supplies of benzodiazepines. Benzodiazepine dependence is almost certain in individuals who are members of a tranquilizer self-help group. Research has found that about 40 percent of people with a diagnosis of benzodiazepine dependence are not aware that they are dependent on benzodiazepines, whereas about 11 percent of people judged not to be dependent believe that they are. When assessing a person for benzodiazepine dependence, asking specific questions rather than questions based on concepts is recommended by experts as the best approach of getting a more accurate diagnosis. For example, asking persons if they “think about the medication at times of the day other than when they take the drug” would provide a more meaningful answer than asking “do you think you are psychologically dependent?”. The Benzodiazepine Dependence Self Report Questionnaire is one questionnaire used to assess and diagnose benzodiazepine dependence. Benzodiazepine dependence is the condition resulting from repeated use of benzodiazepine drugs. It can include both a physical dependence as well as a psychological dependence and is typified by a withdrawal syndrome upon a fall in blood plasma levels of benzodiazepines, e.g., during dose reduction or abrupt withdrawal. Due to the risk of developing tolerance, dependence, and adverse health effects, such as cognitive impairment, benzodiazepines are indicated for short-term use only – a few weeks, followed by a gradual dose reduction. The Committee on the Review of Medicines carried out a review into benzodiazepines due to significant concerns of tolerance, drug dependence, benzodiazepine withdrawal problems, and other adverse effects and published the results in the British Medical Journal in March 1980. The committee found that benzodiazepines do not have any antidepressant or analgesic properties and are, therefore, unsuitable treatments for conditions such as depression, tension headaches, and dysmenorrhea. Benzodiazepines are also not beneficial in the treatment of psychosis. The committee also recommended against benzodiazepines for use in the treatment of anxiety or insomnia in children. The committee was in agreement with the Institute of Medicine (USA) and the conclusions of a study carried out by the White House Office of Drug Policy and the National Institute on Drug Abuse (USA) that there is little evidence that long-term use of benzodiazepine hypnotics are beneficial in the treatment of insomnia due to the development of tolerance. Benzodiazepines tend to lose their sleep-promoting properties within 3–14 days of continuous use, and, in the treatment of anxiety, the committee found that there was little convincing evidence that benzodiazepines retains efficacy in the treatment of anxiety after 4 months of continuous use due to the development of tolerance. 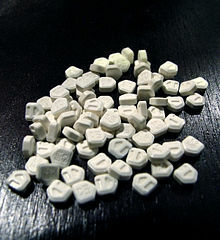 The committee found that the regular use of benzodiazepines causes the development of dependence characterized by tolerance to the therapeutic effects of benzodiazepines and the development of the benzodiazepine withdrawal syndrome including symptoms such as anxiety, apprehension, tremors, insomnia, nausea, and vomiting upon cessation of benzodiazepine use. Withdrawal symptoms tend to develop within 24 hours upon cessation of short-acting benzodiazepines, and 3–10 days after cessation of longer-acting benzodiazepines. Withdrawal effects could occur after treatment, lasting only 2 weeks at therapeutic dose levels; however, withdrawal effects tend to occur with habitual use beyond 2 weeks and are more likely the higher the dose. The withdrawal symptoms may appear to be similar to the original condition. The committee recommended that all benzodiazepine treatment be withdrawn gradually and recommended that benzodiazepine treatment be used only in carefully selected patients and that therapy be limited to short-term use only. It was noted in the review that alcohol can potentiate the central nervous system-depressant effects of benzodiazepines and should be avoided. The central nervous system-depressant effects of benzodiazepines may make driving or operating machinery dangerous, and the elderly are more prone to these adverse effects. High single doses or repeated low doses have been reported to produce hypotonia, poor sucking, and hypothermia in the neonate, and irregularities in the fetal heart. The committee recommended that benzodiazepines be avoided in lactation. The committee recommended that withdrawal from benzodiazepines be gradual, as abrupt withdrawal from high doses of benzodiazepines may cause confusion, toxic psychosis, convulsions, or a condition resembling delirium tremens. Abrupt withdrawal from lower doses may cause depression, nervousness, rebound insomnia, irritability, sweating, and diarrhea. on the present available evidence, the true addiction potential of benzodiazepines was low. The number dependent on the benzodiazepines in the UK from 1960 to 1977 has been estimated to be 28 persons. This is equivalent to a dependence rate of 5-10 cases per million patient months. Benzodiazepines are regarded as a highly addictive drug class. A psychological and physical dependence can develop in as short as a few weeks but may take years to develop in other individuals. Patients wanting to withdraw from benzodiazepines typically receive little advice or support, and such withdrawal should be by small increments over a period of months. Benzodiazepines are usually prescribed only short-term, as there is little justification for their prescribing long-term. Some doctors however, disagree and believe long-term use beyond 4 weeks is sometimes justified, although there is little data to support this viewpoint. Such viewpoints are a minority in the medical literature. There is no evidence that “drug holidays” or periods of abstinence reduced the risk of dependence; there is evidence from animal studies that such an approach does not prevent dependence from happening. Use of short-acting benzodiazepines is associated with interdose withdrawal symptoms. Kindling has clinical relevance with regard to benzodiazepines; for example, there is an increasing shift to use of benzodiazepines with a shorter half-life and intermittent use, which can result in interdose withdrawal and rebound effects. Cognitive behavioral therapy has been found to be more effective for the long-term management of insomnia than sedative hypnotic drugs. No formal withdrawal programs for benzodiazepines exists with local providers in the UK. Meta-analysis of published data on psychological treatments for insomnia show a success rate between 70 and 80%. A large-scale trial utilizing cognitive behavioral therapy in chronic users of sedative hypnotics including nitrazepam, temazepam, and zopiclone found CBT to be a significantly more effective long-term treatment for chronic insomnia than sedative hypnotic drugs. Persisting improvements in sleep quality, sleep onset latency, increased total sleep, improvements in sleep efficiency, significant improvements in vitality, physical and mental health at 3-, 6-, and 12-month follow-ups were found in those receiving CBT. A marked reduction in total sedative hypnotic drug use was found in those receiving CBT, with 33% reporting zero hypnotic drug use. Age has been found not to be a barrier to successful outcome of CBT. It was concluded that CBT for the management of chronic insomnia is a flexible, practical, and cost-effective treatment, and it was also concluded that CBT leads to a reduction of benzodiazepine drug intake in a significant number of patients. Chronic use of hypnotic medications is not recommended due to their adverse effects on health and the risk of dependence. A gradual taper is usual clinical course in getting people off of benzodiazepines, but, even with gradual reduction, a large proportion of people fail to stop taking benzodiazepines. The elderly are particularly sensitive to the adverse effects of hypnotic medications. A clinical trial in elderly people dependent on benzodiazepine hypnotics showed that the addition of CBT to a gradual benzodiazepine reduction program increased the success rate of discontinuing benzodiazepine hypnotic drugs from 38% to 77% and at the 12-month follow-up from 24% to 70%. The paper concluded that CBT is an effective tool for reducing hypnotic use in the elderly and reducing the adverse health effects that are associated with hypnotics such as drug dependence, cognitive impairments, and increased road traffic accidents. A study of patients undergoing benzodiazepine withdrawal who had a diagnosis of generalized anxiety disorder showed that those having received CBT had a very high success rate of discontinuing benzodiazepines compared to those not having receive CBT. This success rate was maintained at the 12-month follow-up. Furthermore, it was found that, in patients having discontinued benzodiazepines, they no longer met the diagnosis of general anxiety disorder, and that the number of patients no longer meeting the diagnosis of general anxiety disorder was higher in the group having received CBT. Thus, CBT can be an effective tool to add to a gradual benzodiazepine dosage reduction program leading to improved and sustained mental health benefits (Disputed). Sending a letter to patients warning of the adverse effects of long-term use of benzodiazepines and recommending dosage reduction has been found to be successful and a cost-effective strategy in reducing benzodiazepine consumption in general practice. Within a year of the letter’s going out, there was found to be a 17% fall in the number of benzodiazepines being prescribed, with 5% of patients having totally discontinued benzodiazepines. A study in the Netherlands reported a higher success rate by sending a letter to patients who are benzodiazepine-dependent. The results of the Dutch study reported 11.3% of patients discontinuing benzodiazepines completely within a year. Flumazenil delivered via slow subcutaneous infusion represents a safe procedure for those withdrawing from long-term, high dose benzodiazepine dependency. It has a low risk of seizures even amongst those who have experienced convulsions when previously attempting benzodiazepine withdrawal. Research studies have come to different conclusions on the number of therapeutic dose users who develop a physical dependence and withdrawal syndrome. Estimates by researchers of the number of people affected range 20–100% of patients prescribed benzodiazepines at therapeutic dosages long term are physically dependent and will experience withdrawal symptoms. Benzodiazepines can be addictive and induce dependence even at low doses, with 23% becoming addicted within 3 months of use. Benzodiazepine addiction is considered a public health problem. Approximately 68.5% of prescriptions of benzodiazepines originate from local health centers, with psychiatry and general hospitals accounting for 10% each. A survey of general practitioners reported that the reason for initiating benzodiazepines was due to an empathy for the patients suffering and a lack of other therapeutic options rather than patients demanding them. However, long-term use was more commonly at the insistence of the patient, it is presumed, because physical dependence or addiction had developed. Approximately twice as many women as men are prescribed benzodiazepines. It is believed that this is largely because men typically turned to alcohol to cope with stress and women to prescription drugs. Biased perception of women by male doctors may also play a role in increased prescribing rates to women; however, increased anxiety features in women does not account for the wide gap alone between men and women. Based on findings in the US from the Treatment Episode Data Set (TEDS), an annual compilation of patient characteristics in substance abuse treatment facilities in the United States, admissions due to “primary tranquilizer” (including, but not limited to, benzodiazepine-type) drug use increased 79% from 1992 to 2002. A study published in the British Journal of General Practice in July 2017 found that in a sample taken from a survey conducted in 2014–2015 in Bradford a mean of 0.69% of registered patients had been prescribed benzodiazepines for more than a year. This would suggest that there were around 300,000 long-term users of diazepine in the UK. Previously, physical dependence on benzodiazepines was largely thought to occur only in people on high-therapeutic-dose ranges. Low- or normal-dose dependence was not suspected until the 1970s, and it was not until the early 1980s that it was confirmed. Low-dose dependence has now been clearly demonstrated in both animal studies and human studies, and is a recognized clinical disadvantage of benzodiazepines. Severe withdrawal syndromes can occur from these low doses of benzodiazepines even after gradual dose reduction. An estimated 30–45% of chronic low-dose benzodiazepine users are dependent and it has been recommended that benzodiazepines even at low dosage be prescribed for a maximum of 7–14 days to avoid dependence. As a result, the global trend is toward strict regulations for the prescription of benzodiazepines due to this risk of low-dose dependence. Some controversy remains, however, in the medical literature as to the exact nature of low-dose dependence and the difficulty in getting patients to discontinue their benzodiazepines, with some papers attributing the problem to predominantly drug-seeking behavior and drug craving, whereas other papers having found the opposite, attributing the problem to a problem of physical dependence with drug-seeking and craving not being typical of low-dose benzodiazepine users. Benzodiazepines are one of the largest classes of abused drugs; they are classed as schedule IV controlled drugs because of their recognized medical uses. Across the world the most frequently diverted and abused benzodiazepines include temazepam, diazepam, nimetazepam, nitrazepam, triazolam, flunitrazepam, midazolam, and in the United States alprazolam, clonazepam, and lorazepam. Benzodiazepines can cause serious addiction problems. A survey of doctors in Senegal found that many doctors feel that their training and knowledge of benzodiazepines is, in general, poor; a study in Dakar found that almost one-fifth of doctors ignored prescribing guidelines regarding short-term use of benzodiazepines, and almost three-quarters of doctors regarded their training and knowledge of benzodiazepines to be inadequate. More training regarding benzodiazepines has been recommended for doctors. Due to the serious concerns of addiction, national governments were recommended to urgently seek to raise knowledge via training about the addictive nature of benzodiazepines and appropriate prescribing of benzodiazepines. A six-year study on 51 Vietnam veterans who were drug abusers of either mainly stimulants (11 people), mainly opiates (26 people), or mainly benzodiazepines (14 people) was carried out to assess psychiatric symptoms related to the specific drugs of abuse. After six years, opiate abusers had little change in psychiatric symptomatology; five of the stimulant users had developed psychosis, and eight of the benzodiazepine users had developed depression. Therefore, long-term benzodiazepine abuse and dependence seems to carry a negative effect on mental health, with a significant risk of causing depression. Benzodiazepines are also sometimes abused intra-nasally. In the elderly, alcohol and benzodiazepines are the most commonly abused substances, and the elderly population is more susceptible to benzodiazepine withdrawal syndrome and delirium than are younger patients. ^ de Wit H; Griffiths RR (June 1991). “Testing the abuse liability of anxiolytic and hypnotic drugs in humans”. Drug and Alcohol Dependence. 28 (1): 83–111. doi:10.1016/0376-8716(91)90054-3. PMID 1679388. Retrieved 21 December 2012. ^ Nutt DJ (1 January 1986). “Benzodiazepine dependence in the clinic: reason for anxiety”. Trends Neurosci. 7: 457–460. doi:10.1016/0165-6147(86)90420-7. Retrieved 21 December 2012. ^ Uzun S; Kozumplik O; Jakovljević M; Sedić B (Mar 2010). “Side effects of treatment with benzodiazepines”. Psychiatr Danub. 22 (1): 90–3. PMID 20305598. ^ O’brien CP (2005). “Benzodiazepine use, abuse, and dependence”. J Clin Psychiatry. 66 (Suppl 2): 28–33. PMID 15762817. ^ a b c d e f Allison C; Pratt JA (May 2003). “Neuroadaptive processes in GABAergic and glutamatergic systems in benzodiazepine dependence”. Pharmacol. Ther. 98 (2): 171–95. doi:10.1016/S0163-7258(03)00029-9. PMID 12725868. ^ a b c Haddad P; Deakin B; Dursun S (27 May 2004). “Benzodiazepine dependence”. Adverse Syndromes and Psychiatric Drugs: A clinical guide. Oxford University Press. pp. 240–252. ISBN 978-0-19-852748-0. ^ Cloos JM; Ferreira V (January 2009). “Current use of benzodiazepines in anxiety disorders”. Current Opinion in Psychiatry. 22 (1): 90–95. doi:10.1097/YCO.0b013e32831a473d. PMID 19122540. ^ a b Puri BK; Tyrer P (28 August 1998). “Clinical psychopharmacology”. Sciences Basic to Psychiatry (2nd ed.). Churchill Livingstone. pp. 155–157. ISBN 978-0-443-05514-0. Retrieved 2009-07-11. ^ a b c d Longo LP; Johnson B (April 2000). “Addiction: Part I. Benzodiazepines–side effects, abuse risk and alternatives”. Am Fam Physician. 61 (7): 2121–8. PMID 10779253. ^ a b Khong E; Sim MG; Hulse G (Nov 2004). “Benzodiazepine dependence” (PDF). Aust Fam Physician. 33 (11): 923–6. PMID 15584332. ^ National Treatment Agency for Substance Misuse (2007). “Drug misuse and dependence – UK guidelines on clinical management” (PDF). United Kingdom: Department of Health. Archived from the original (PDF) on 2012-10-08. Retrieved 2009-11-30. ^ a b Marriott S; Tyrer P (August 1993). “Benzodiazepine dependence. Avoidance and withdrawal”. Drug Safety. 9 (2): 93–103. doi:10.2165/00002018-199309020-00003. PMID 8104417. ^ Madhusoodanan S; Bogunovic OJ (September 2004). “Safety of benzodiazepines in the geriatric population”. Expert Opin Drug Saf. 3 (5): 485–93. doi:10.1517/14740338.3.5.485. PMID 15335303. ^ Baillargeon L; Landreville P; Verreault R; Beauchemin JP; Grégoire JP; Morin CM (November 2003). “Discontinuation of benzodiazepines among older insomniac adults treated with cognitive-behavioural therapy combined with gradual tapering: a randomized trial” (PDF). CMAJ. 169 (10): 1015–20. PMC 236226. PMID 14609970. Archived from the original (PDF) on 2011-06-09. Retrieved 2009-07-17. ^ Pétursson H (1994). “The benzodiazepine withdrawal syndrome”. Addiction. 89 (11): 1455–9. doi:10.1111/j.1360-0443.1994.tb03743.x. PMID 7841856. ^ Galanter M; Kleber HD (1 July 2008). The American Psychiatric Publishing Textbook of Substance Abuse Treatment (4th ed.). United States of America: American Psychiatric Publishing Inc. p. 114. ISBN 978-1-58562-276-4. ^ a b Heberlein A; Bleich S; Kornhuber J; Hillemacher T (Jan 2009). “[Benzodiazepine dependence: causalities and treatment options]”. Fortschr Neurol Psychiatr. 77 (1): 7–15. doi:10.1055/s-0028-1100831. PMID 19101875. ^ Potokar J; Coupland N; Wilson S; Rich A; Nutt D (September 1999). “Assessment of GABA(A)benzodiazepine receptor (GBzR) sensitivity in patients on benzodiazepines”. Psychopharmacology. 146 (2): 180–4. doi:10.1007/s002130051104. PMID 10525753. Archived from the original on 2002-01-12. ^ a b Lader Prof; Morgan Prof; Shepherd Prof; Williams Dr P; Skegg Dr; Parish Prof; Tyrer Dr P; Inman Dr; Marks Dr J (Ex-Roche); Harris P (Roche); Hurry T (Wyeth) (30 October 1980 – 3 April 1981). “Benzodiazepine Dependence Medical Research Council headquarters, Closed until 2014 – Opened 2005” (PDF). England: The National Archives. ^ a b Koff JM; Pritchard GA; Greenblatt DJ; Miller LG (November 1997). “The NMDA receptor competitive antagonist CPP modulates benzodiazepine tolerance and discontinuation”. Pharmacology. 55 (5): 217–27. doi:10.1159/000139531. PMID 9399331. ^ Fujita M; Woods SW; Verhoeff NP; et al. (March 1999). “Changes of benzodiazepine receptors during chronic benzodiazepine administration in humans”. Eur. J. Pharmacol. 368 (2–3): 161–72. doi:10.1016/S0014-2999(99)00013-8. PMID 10193652. ^ Poulos CX; Zack M (2004). “Low-dose diazepam primes motivation for alcohol and alcohol-related semantic networks in problem drinkers”. Behavioural Pharmacology. 15 (7): 503–12. doi:10.1097/00008877-200411000-00006. PMID 15472572. ^ Kushner MG; Abrams K; Borchardt C (March 2000). “The relationship between anxiety disorders and alcohol use disorders: a review of major perspectives and findings”. Clin Psychol Rev. 20 (2): 149–71. doi:10.1016/S0272-7358(99)00027-6. PMID 10721495. ^ Khanna JM; Kalant H; Weiner J; Shah G (1992). “Rapid tolerance and cross-tolerance as predictors of chronic tolerance and cross-tolerance”. Pharmacol. Biochem. Behav. 41 (2): 355–60. doi:10.1016/0091-3057(92)90110-2. PMID 1574525. ^ Allan AM; Baier LD; Zhang X (1992). “Effects of lorazepam tolerance and withdrawal on GABAA receptor-operated chloride channels”. J. Pharmacol. Exp. Ther. 261 (2): 395–402. PMID 1374467. ^ Rooke KC (1976). “The use of flurazepam (dalmane) as a substitute for barbiturates and methaqualone/diphenhydramine (mandrax) in general practice”. J Int Med Res. 4 (5): 355–9. doi:10.1177/030006057600400510. PMID 18375. ^ Reddy DS; Rogawski MA (1 December 2000). “Chronic treatment with the neuroactive steroid ganaxolone in the rat induces anticonvulsant tolerance to diazepam but not to itself”. J Pharmacol Exp Ther. 295 (3): 1241–8. PMID 11082461. ^ Martin D; Olsen RW (2000). GABA in the nervous system: the view at fifty. Philadelphia: Lippincott Williams Wilkins. p. 211. ISBN 978-0-7817-2267-4. ^ Kroboth PD; McAuley JW (1997). “Progesterone: does it affect response to drug?”. Psychopharmacol Bull. 33 (2): 297–301. PMID 9230647. ^ Smith SS (2004). Neurosteroid effects in the central nervous system: the role of the GABA-A receptor. Boca Raton, Fla.: CRC Press. pp. 144–145. ISBN 978-0-8493-2392-8. ^ Rho JM; Sankar R; Cavazos JE (2004). Epilepsy: scientific foundations of clinical practice. New York: M. Dekker. p. 336. ISBN 978-0-8247-5043-5. ^ Kaltschmidt C; Kaltschmidt B; Baeuerle PA (1995). “Stimulation of ionotropic glutamate receptors activates transcription factor NF-kappa B in primary neurons”. Proc. Natl. Acad. Sci. U.S.A. 92 (21): 9618–22. Bibcode:1995PNAS…92.9618K. doi:10.1073/pnas.92.21.9618. PMC 40853. PMID 7568184. ^ Humphries P; Pretorius E; Naudé H (2007). “Direct and indirect cellular effects of aspartame on the brain”. European Journal of Clinical Nutrition. 62 (4): 451–62. doi:10.1038/sj.ejcn.1602866. ISSN 0954-3007. PMID 17684524. ^ Herlenius E, Langercrantz H (2004). “Development of neurotransmitter systems during critical periods”. Exp Neurol. 190: 8–21. doi:10.1016/j.expneurol.2004.03.027. PMID 15498537. ^ “Synapses”. The Brain from Top to Bottom. McGill University. ^ a b c d e f Professor Heather Ashton (2002). “Benzodiazepines: How They Work and How to Withdraw”. ^ Brown TM; Stoudemire (1998). “Chapter 7 Sedative-Hypnotics and Related Agents”. Psychiatric side effects of prescription and over-the-counter medications: recognition and management. USA: American Psychiatric Press Inc. pp. 132–133. ISBN 978-0-88048-868-6. ^ Wichniak A; Brunner H; Ising M; Pedrosa Gil F; Holsboer F; Friess E (October 2004). “Impaired hypothalamic-pituitary-adrenocortical (HPA) system is related to severity of benzodiazepine withdrawal in patients with depression”. Psychoneuroendocrinology. 29 (9): 1101–8. doi:10.1016/j.psyneuen.2003.11.004. PMID 15219633. ^ Biggio G; Dazzi L; Biggio F; et al. (December 2003). “Molecular mechanisms of tolerance to and withdrawal of GABA(A) receptor modulators”. Eur Neuropsychopharmacol. 13 (6): 411–23. doi:10.1016/j.euroneuro.2003.08.002. PMID 14636957. ^ Bateson AN (2002). “Basic pharmacologic mechanisms involved in benzodiazepine tolerance and withdrawal”. Curr. Pharm. Des. 8 (1): 5–21. doi:10.2174/1381612023396681. PMID 11812247. ^ Follesa P; Cagetti E; Mancuso L; et al. (August 2001). “Increase in expression of the GABA(A) receptor alpha(4) subunit gene induced by withdrawal of, but not by long-term treatment with, benzodiazepine full or partial agonists”. Brain Res. Mol. Brain Res. 92 (1–2): 138–48. doi:10.1016/S0169-328X(01)00164-4. PMID 11483250. ^ a b c d e Polmear A (31 March 2008). Evidence-Based Diagnosis in Primary Care: Practical Solutions to Common Problems. United Kingdom: Butterworth-Heinemann. pp. 346–347. ISBN 978-0-7506-4910-0. ^ ICD-10 (2007). “Chapter V – Mental and behavioural disorders (F00-F99) – Mental and behavioural disorders due to psychoactive substance use, 10-F19)”. World Health Organisation. Archived from the original on 2009-07-27. ^ Authier=N; Balayssac D; Sautereau M; Zangarelli A; Courty P; Somogyi AA; Vennat B; Llorca PM; Eschalier A (Nov 2009). “Benzodiazepine dependence: focus on withdrawal syndrome”. Ann Pharm Fr. 67 (6): 408–13. doi:10.1016/j.pharma.2009.07.001. PMID 19900604. ^ Tyrer P; Silk KR, eds. (24 January 2008). “Treatment of sedative-hypnotic dependence”. Cambridge Textbook of Effective Treatments in Psychiatry (1st ed.). Cambridge University Press. p. 402. ISBN 978-0-521-84228-0. ^ Karch SB (20 December 2006). Drug Abuse Handbook (2nd ed.). United States of America: CRC Press. p. 617. ISBN 978-0-8493-1690-6. ^ a b c d e f Committee on the Review of Medicines (March 29, 1980). “Systematic review of the benzodiazepines. Guidelines for data sheets on diazepam, chlordiazepoxide, medazepam, clorazepate, lorazepam, oxazepam, temazepam, triazolam, nitrazepam, and flurazepam. Committee on the Review of Medicines”. Br Med J. 280 (6218): 910–2. doi:10.1136/bmj.280.6218.910. PMC 1601049. PMID 7388368. ^ Casati A; Sedefov R; Pfeiffer-Gerschel T (2012). “Misuse of medicines in the European Union: a systematic review of the literature”. Eur Addict Res. 18 (5): 228–45. doi:10.1159/000337028. PMID 22572594. ^ Authier N; Balayssac D; Sautereau M; Zangarelli A; Courty P; Somogyi AA; Vennat B; Llorca PM; EschalierA (Nov 2009). “Benzodiazepine dependence: focus on withdrawal syndrome”. Ann Pharm Fr. 67 (6): 408–13. doi:10.1016/j.pharma.2009.07.001. PMID 19900604. ^ Panus P; Katzung BG; Jobst EE; Tinsley S; Masters SB; Trevor AJ (November 2008). “Sedative-hypnotic drugs”. Pharmacology for the Physical Therapist (1 ed.). McGraw-Hill Medical. p. 192. ISBN 978-0-07-146043-9. ^ Tyrer P; Silk KR, eds. (24 January 2008). Cambridge Textbook of Effective Treatments in Psychiatry (1st ed.). Cambridge University Press. p. 532. ISBN 978-0-521-84228-0. ^ Morgan K; Dixon S; Mathers N; Thompson J; Tomeny M (February 2004). “Psychological treatment for insomnia in the regulation of long-term hypnotic drug use” (PDF). Health Technol Assess. National Institute for Health Research. 8 (8): iii–iv, 1–68. doi:10.3310/hta8080. PMID 14960254. Archived from the original (PDF) on 2009-11-16. Retrieved 2009-11-30. ^ Baillargeon L; Landreville P; Verreault R; Beauchemin JP; Grégoire JP; Morin CM (November 2003). “Discontinuation of benzodiazepines among older insomniac adults treated with cognitive-behavioural therapy combined with gradual tapering: a randomized trial”. CMAJ. 169 (10): 1015–20. PMC 236226. PMID 14609970. ^ Gosselin P; Ladouceur R; Morin CM; Dugas MJ; Baillargeon L (October 2006). “Benzodiazepine discontinuation among adults with GAD: A randomized trial of cognitive-behavioral therapy”. J Consult Clin Psychol. 74 (5): 908–19. doi:10.1037/0022-006X.74.5.908. PMID 17032095. ^ Morgan JD; Wright DJ; Chrystyn H (December 2002). “Pharmacoeconomic evaluation of a patient education letter aimed at reducing long-term prescribing of benzodiazepines” (PDF). Pharm World Sci. 24 (6): 231–5. doi:10.1023/A:1021587209529. PMID 12512155. ^ Stewart R; Niessen WJ; Broer J; Snijders TA; Haaijer-Ruskamp FM; Meyboom-De Jong B (October 2007). “General Practitioners reduced benzodiazepine prescriptions in an intervention study: a multilevel application”. J Clin Epidemiol. 60 (10): 1076–84. doi:10.1016/j.jclinepi.2006.11.024. PMID 17884604. ^ Faccini, Marco; Leone, Roberto; Opri, Sibilla; Casari, Rebecca; Resentera, Chiara; Morbioli, Laura; Conforti, Anita; Lugoboni, Fabio (October 2016). “Slow subcutaneous infusion of flumazenil for the treatment of long-term, high-dose benzodiazepine users: a review of 214 cases”. Journal of Psychopharmacology (Oxford, England). 30 (10): 1047–1053. doi:10.1177/0269881116647505. ISSN 1461-7285. PMID 27166362. ^ Tamburin, Stefano; Faccini, Marco; Casari, Rebecca; Federico, Angela; Morbioli, Laura; Franchini, Enrica; Bongiovanni, Luigi Giuseppe; Lugoboni, Fabio (October 2017). “Low risk of seizures with slow flumazenil infusion and routine anticonvulsant prophylaxis for high-dose benzodiazepine dependence”. Journal of Psychopharmacology (Oxford, England). 31 (10): 1369–1373. doi:10.1177/0269881117714050. ISSN 1461-7285. PMID 28613124. ^ Ashton CH (1997). “Benzodiazepine Dependency”. In Baum A; Newman S; Weinman J; West R; McManus C. Cambridge Handbook of Psychology & Medicine. England: Cambridge University Press. pp. 376–80. ^ Anthierens S; Habraken H; Petrovic M; Christiaens T (December 2007). “The lesser evil? Initiating a benzodiazepine prescription in general practice: a qualitative study on GPs’ perspectives” (PDF). Scand J Prim Health Care. 25 (4): 214–9. doi:10.1080/02813430701726335. PMC 3379762. PMID 18041658. ^ Barthelmé B; Poirot Y (November 2008). “Niveau d’anxiété et de dépendance des primoconsommants d’anxiolytiques : une étude de psychométrie” [Anxiety level and addiction to first-time prescriptions of anxiolytics: a psychometric study]. Presse Med [Medical Press] (in French). 37 (11): 1555–60. doi:10.1016/j.lpm.2007.10.019. PMID 18502091. ^ Licata SC; Rowlett JK (2008). “Abuse and dependence liability of benzodiazepine-type drugs: GABA(A) receptor modulation and beyond”. Pharmacology Biochemistry and Behavior. 90 (1): 74–89. doi:10.1016/j.pbb.2008.01.001. PMC 2453238. PMID 18295321. ^ Davies, James; Rae, Todd; Montague, Luke (17 July 2017). “Long-term benzodiazepine and Z-drugs use in the UK: a survey of general practice”. British Journal of General Practice. 67 (662): e609–e613. doi:10.3399/bjgp17X691865. PMC 5569740. PMID 28716996. ^ Fruensgaard K (February 1976). “Withdrawal psychosis: a study of 30 consecutive cases”. Acta Psychiatr Scand. 53 (2): 105–18. doi:10.1111/j.1600-0447.1976.tb00065.x. PMID 3091. ^ Lader M (1991). “History of benzodiazepine dependence”. Journal of Substance Abuse Treatment. 8 (1–2): 53–9. doi:10.1016/0740-5472(91)90027-8. PMID 1675692. ^ Lucki I; Kucharik RF (1990). “Increased sensitivity to benzodiazepine antagonists in rats following chronic treatment with a low dose of diazepam”. Psychopharmacology. 102 (3): 350–6. doi:10.1007/BF02244103. PMID 1979180. ^ Rickels K; Case WG; Schweizer EE; Swenson C; Fridman RB (1986). “Low-dose dependence in chronic benzodiazepine users: a preliminary report on 119 patients”. Psychopharmacology Bulletin. 22 (2): 407–15. PMID 2877472. ^ Miura S; Murasaki M (March 1992). “The future of 5-HT1A receptor agonists. (Aryl-piperazine derivatives)”. Progress in Neuro-Psychopharmacology & Biological Psychiatry. 16 (6): 833–45. doi:10.1016/0278-5846(92)90103-L. PMID 1355301. ^ Meier PJ; Ziegler WH; Neftel K (March 19, 1988). “Benzodiazepine–Praxis und Probleme ihrer Anwendung” [Benzodiazepine–practice and problems of its use]. Schweizerische medizinische Wochenschrift [Swiss Medical Weekly]. 118 (11): 381–92. PMID 3287602. ^ Tsuji K; Tajima O (January 2012). “[Anxiolytic]”. Nippon Rinsho (in Japanese). 70 (1): 42–6. PMID 22413490. ^ Linden M; Bär T; Geiselmann B (May 1998). “Patient treatment insistence and medication craving in long-term low-dosage benzodiazepine prescriptions”. Psychological Medicine. 28 (3): 721–9. doi:10.1017/S0033291798006734. PMID 9626728. ^ Tyrer P (1993). “Benzodiazepine dependence: a shadowy diagnosis”. Biochemical Society Symposia. 59: 107–19. PMID 7910738. ^ Karch SB (20 December 2006). Drug Abuse Handbook (2nd ed.). USA: CRC Press. p. 35. ISBN 978-0-8493-1690-6. ^ Dièye AM; Sy AN; Sy GY; et al. (2007). “Prescription des benzodiazepines par les medecins generalistes du prive a Dakar: Enquete sur les connaissances et les attitudes” [Prescription of benzodiazepines by general practitioners in the private sector of Dakar: survey on knowledge and attitudes]. Thérapie (in French). 62 (2): 163–8. doi:10.2515/therapie:2007018. PMID 17582318. ^ Dièye AM; Sylla M; Ndiaye A; Ndiaye M; Sy GY; Faye B (June 2006). “Benzodiazepines prescription in Dakar: a study about prescribing habits and knowledge in general practitioners, neurologists and psychiatrists”. Fundam Clin Pharmacol. 20 (3): 235–8. doi:10.1111/j.1472-8206.2006.00400.x. PMID 16671957. Archived from the original on 2013-01-05. ^ Woody GE; Mc Lellan AT; O’Brien CP (1979). “Development of psychiatric illness in drug abusers. Possible role of drug preference”. The New England Journal of Medicine. 301 (24): 1310–4. doi:10.1056/NEJM197912133012403. PMID 41182. ^ Sheehan MF; Sheehan DV; Torres A; Coppola A; Francis E (1991). “Snorting benzodiazepines”. Am J Drug Alcohol Abuse. 17 (4): 457–68. doi:10.3109/00952999109001605. PMID 1684083. ^ Wetterling T; Backhaus J; Junghanns K (September 2002). “Sucht im Alter Ein unterschätztes Problem in der klinischen Versorgung älterer Menschen?” [Addiction in the elderly – an underestimated diagnosis in clinical practice?]. Nervenarzt (in German). 73 (9): 861–6. doi:10.1007/s00115-002-1359-3. PMID 12215877.